I don't think I could order these Tsum Tsums in order of preference but if I *had* to choose, this one would probably be my favourite! One of my friends kindly got her Sister to pick one of these up for us each when she was in New York and I'm so grateful! She's so cute and pretty. How cute is this Minnie in a little Queen outfit?! I'm obsessed with her little crown and velvet cape! 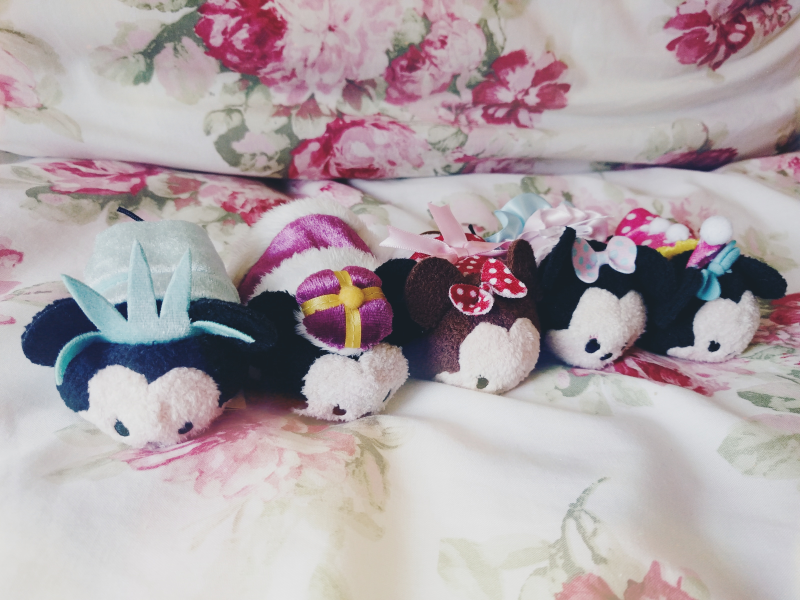 This has got to be my favourite-ever collection of Tsum Tsums as it combines two of my favourite things - bows and polka dots! Sadly I went paid mega bucks for this collection while it was a Japan exclusive, only for the UK Disney Store to release them all as a very reasonably-priced box set a few months later... Ooops! When we went to Hong Kong last year the boyfriend surprised me with this set whilst we were shopping in the Disney Store before we'd even left the airport! I don't have any of the Harajuku-style Tsum Tsum sets so this was a lovely surprise. 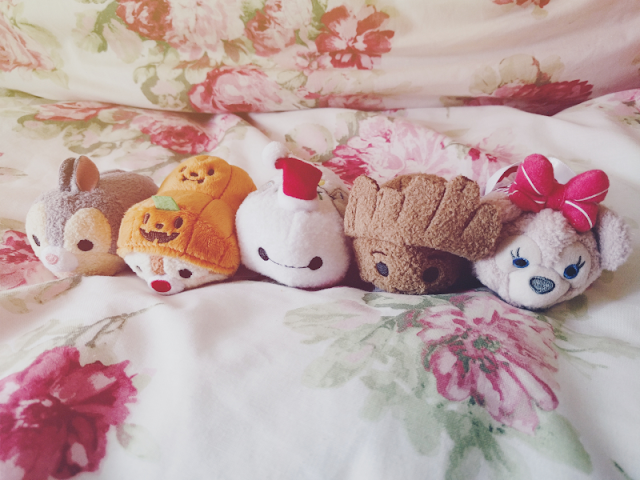 Another set of Tsums that I paid a lot of money for, but I'm still so glad I bought them! 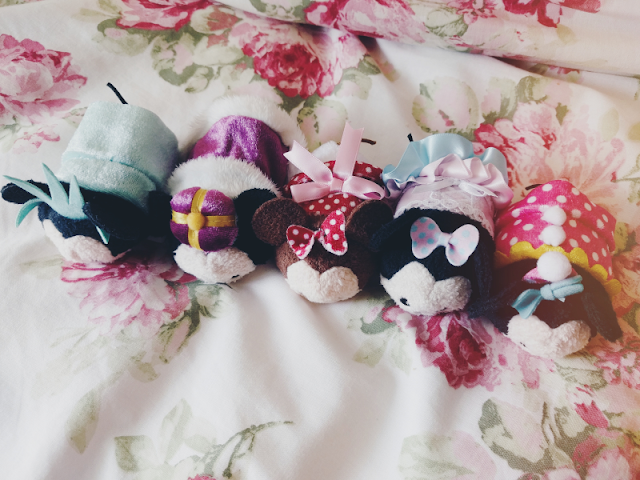 I have Mickey and Minnie from this set and they're worth it alone for their adorable little birthday hats! The little rabbit that started it all! 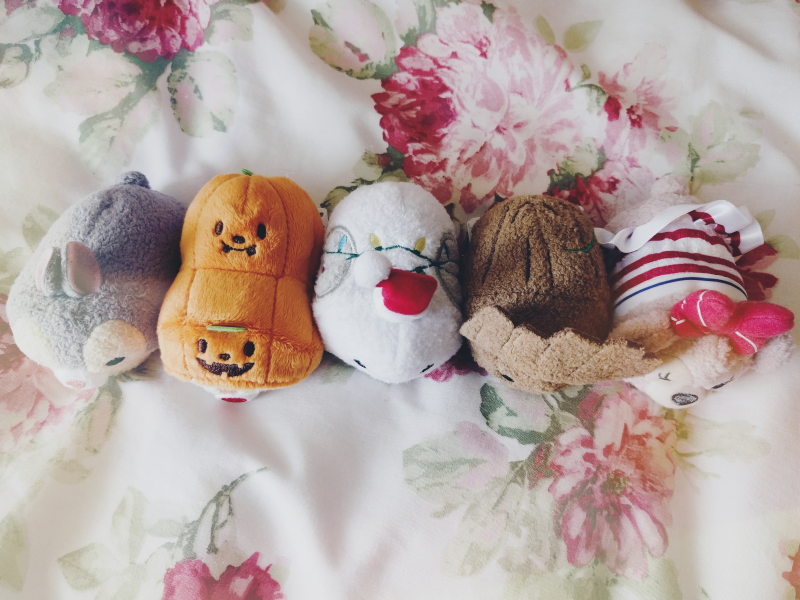 For weeks I kept wandering into Clintons like a moth to a flame every time I passed to look at their Tsum Tsums and then one day my boyfriend treated me to a little Thumper and the craziness began! Although I may have missed out on the ever sought-after Pumpkin Mickey and Minnie these Pumpkin-costumed Chip and Dale help to make up for it! The design on them is so lovely and they're also incredibly soft! There were so many brilliantly designed Tsum Tsums in the advent calendar that the Disney Store released last year but I think Baymax has to be my favourite. 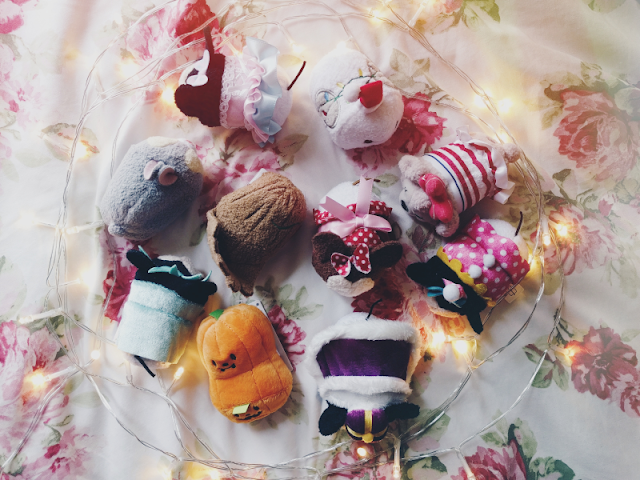 The fairy lights and little Santa hat are just too cute to handle! He may not be rare or exclusive, but he's just SO DAMN CUTE! When we were waiting to our flight home from Hong Kong last year I had some Hong Kong Dollars left over so of course I had to spend them in the airport Disney Store! I chose a Spring set with Duffy and ShellieMay in these adorable nautical-style outfits. Although you can't see it from the photos they have little Mickeys embroidered on their bottoms which is such a lovely little touch. 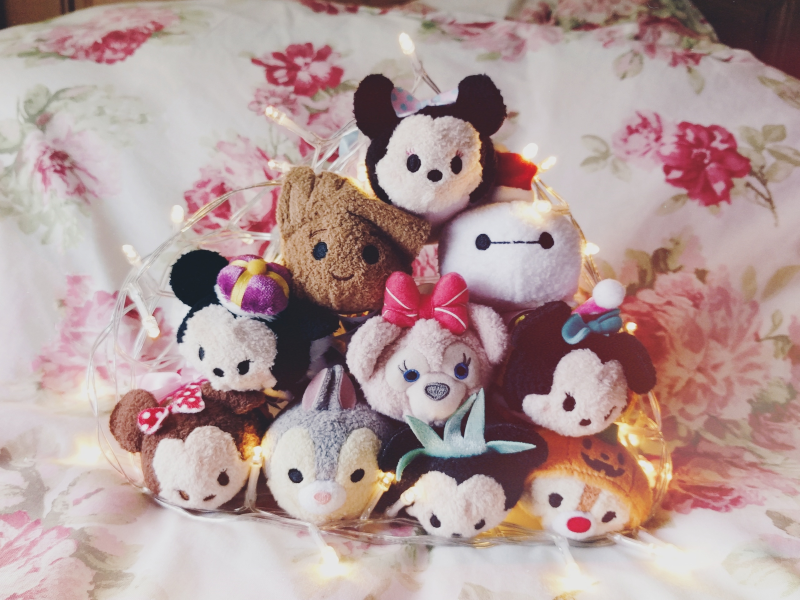 Do you have any of these Tsums? Let me know which of your own collection would make your top 10 list! Love them all! My New York Minnie Mouse is one of my favourites in my collection as well. Baymax looks so cute! I have the Japan valentines day minnie mouse too which is one of my faves, I think I'd have that in my favourites collection and I love my little mermaid ones so possibly those and this cupcake one I got in new york that says 2017 haha! It's hard to choose!